Well, this Independence Day, Kanan and I first spent time at the beach and watching all the packing in, went on a bike ride with Kanan’s Dad and played at the park. Then after we had lunch and said goodbye, the little munckin and I jumped into the car and went up to my old stomping grounds in Upland, California to celebrate our life, liberty, and pursuit of happiness away from the madness of San Diego. Kanan slept about 45 min of the ride up which gave him enough of a rest to keep him going the rest of the day. We had a great time swimming and playing with the other little kids in my friend Lisa’s backyard. I thought for sure Kanan would be ready for another nap around 4 or so given he slept so little, but the little guy didn’t want to go to bed until around 9 oclock! After all the fun in the sun and barbeque food, he took a bubble bath with his good friend Nolan and then got ready for bed. 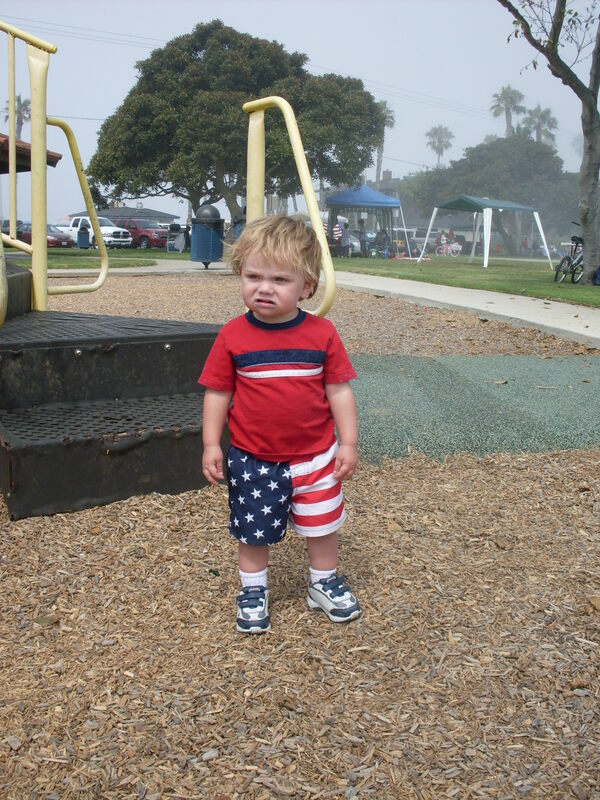 Here he is all decked out in his Fourth of July clothes. Thanks Great Auntie Julie for the cool shorts. They were a hit! Although Kanan wasn’t too impressed as we can see in the photo. Oh well, this stuff is mostly for our pleasure anyway, right?